Leather has a long history and one could spend a lifetime learning all there is to know about leather tanning and craftsmanship. But this isn’t what this guide is for. This guide is for those who need an introduction to leather to help them make informed purchasing decisions, shed some light on common terms and appreciate the craftsmanship behind the boots they already own. It’s for those who want to know the difference between marketing jargon and the real deal. What exactly does it mean when boots are made from veg-tanned shell cordovan leather? And why should you pay an extra $200 for a pair? With so many types of leather boots it can get confusing navigating your options. We cover everything from leather tanning, grading and types of leather for boots. Although this guide might not cover every type of leather available, it does a good job at covering the most common options. Vegetable tanned hides result in a natural pink cue. Vegetable tanned leather is treated with organic matter called tannins, a compound that binds to the proteins of the hide. Tannin is normally found in tree bark, wood and fruits. During the leather tanning process the hides are soaked in a tannin solution for enough time to allow the tannin to replace the water in the hide. This is a complex process that required multiple treatments over the course of months. Because of it’s complexity, many tanneries have abandoned vegetable tanning for faster and cheaper tanning methods. Because no harsh chemicals are used, vegetable tanning results in thicker leather. Vegetable tanned leather ages beautifully. Patina forms as the leather is used. Because of it’s organic nature, vegetable tanned leather does not contain harmful substances. Expensive: Since the process is long and requires a skilled craftsman, vegetable tanned leather is more expensive than it’s counterparts. Chrome tanned hides result in a blueish hue. Chrome tanning is the most common alternative to traditional vegetable tanning. Unlike vegetable tanning which uses organic compounds, chrome tanning uses chromium sulfate and other chromium salts. One major benefit of the chrome tanning process is that it takes much less time. The entire tanning process can take as little as a day and modern technologies allow for much of it to be automated. Today, most tanneries use chrome tanning for it’s fast processing and low cost. When it comes to footwear leathers, the majority of boot leathers today will be chromed tanned. Many boot brands advertise what kind of leather they use, so if you don’t see the leather specifically described as “vegetable tanned” it’s safe to assume it’s a kind of chrome tanned leather. Popular kinds of chrome tanned leathers are Horween’s Chromexcel and the SB Foot Tanning leather found in Red Wing Heritage boots. Cheaper and faster to manufacture. Most common in footwear. Unlike what the name implies, oil-tanned leather isn’t actually tanned with oil. Instead oil-tanned leather is usually chrome or vegetable tanned leather that has been treated with oils and waxes during the tanning process. The oiling process is done to make the leather softer and more pliable. Bootmakers love it because it’s easier to work with. A big plus in choosing boots made of oil tanned leather is that it’s highly water resistant. Oil tanned leather also has the ability to change character over time and develop a beautiful patina. These kinds of features make oil-tanned leather a popular option for boots and shoes. In this section we’ll go over the common grades of leather. The top portion of the leather closest to the skin is called the “grain”. Under the grain portion of the leather lies the corium. Leathers made from the corium section are called “split” leathers because the leather usually has to be split, or cut, to reach them. Since this section of the hide has looser fibers, split leathers are not as strong or resilient as top-grain leathers. Full-grain leather refers to a hide who’s grain has not been corrected, sanded or buffed. Because of the lack of alteration, full grain leather shows the most signs of life. At this grade you’ll see leathers with natural texture, imperfections and markings of the original hide. Unlike inferior leathers, full grain leather does not wear out. Instead full-grain is known for developing beautiful patinas over time. Since the fibers at the top of the grain are the strongest on the hide, full-grain leather is most often used in high quality boots. Signs of life: Imperfections in full grain leather. Top-grain leather is the most common grade of leather and chances are you’ve seen it first-hand in wallets, purses and shoes. With top-grain leather, the grain has been sanded or buffed to remove imperfections. To help give a uniform appearance, top-grain leather usually has a finishing coat added to the surface. This results in a leather that is less breathable and will not form natural patinas over time. Split leathers are not as strong as their top-grain counterparts. Split leather is when the hide is “split” and the top grain is removed. Because the fibers below the top grain are looser, split leathers are not as strong. However, split leather results in softer leathers with the best example being suede. If the hide is thick enough, multiple splits can occur in the same hide. Since the grain is removed, split leather is not as durable as top-grain leathers. Black corrected leather with an artificial grain pattern. As the name implies, corrected leather is heavily corrected to give the leather a uniform appearance. The leather has it’s grain buffed or sanded before having an artificial grain pattern applied to it’s surface. This artificial grain is supposed to make the leather look like “real” leather but it’s easy to tell the difference. Corrected leather is an inferior leather that doesn’t develop patina, feels plasticky and looks artificial. Bonded leather is made when the leftover scraps of leather are ground up, glued and then pressed together into a sheet. Bonded leather is the worst quality leather and should be avoided, especially when it comes to footwear. Because bonded leather is so cheap, it’s usually reflected in the price of the products. Ever see a cheap leather couch that is peeling? That’s bonded leather. It could be argued that bonded leather really isn’t leather at all. But we decided to add it here anyway so that you are aware of it’s terrible existence. The term “Geniune Leather” has recently picked up a bad reputation. The popular opinion is that genuine leather is the worst quality leather and should be avoided at all costs. But that’s not exactly true. The truth is that all leather is genuine leather. This includes everything from the best full-grain leather to the cheapest corrected leather. What the term “genuine leather” tells us is that it’s not some other material being passed of as leather. What the term doesn’t explain is what grade of leather it is. As a result many manufacturer’s have used the stamp of Genuine Leather to hide the fact that their goods are made from inferior grades of leather. Today, the term genuine leather has become so synonymous with bad quality that most reputable footwear brands avoid the term altogether. Our advice is to use your best judgement when shopping for a new pair of leather boots and to educate yourself on what’s quality and what’s just marketing jargon. For example, if you come across a new $40 pair of boots at your favorite bargain fashion retailer that’s marked as “genuine leather” than it should be safe to assume that the leather used is of a lower grade. There are many different types of leather boots and sometimes the terms can get confusing. 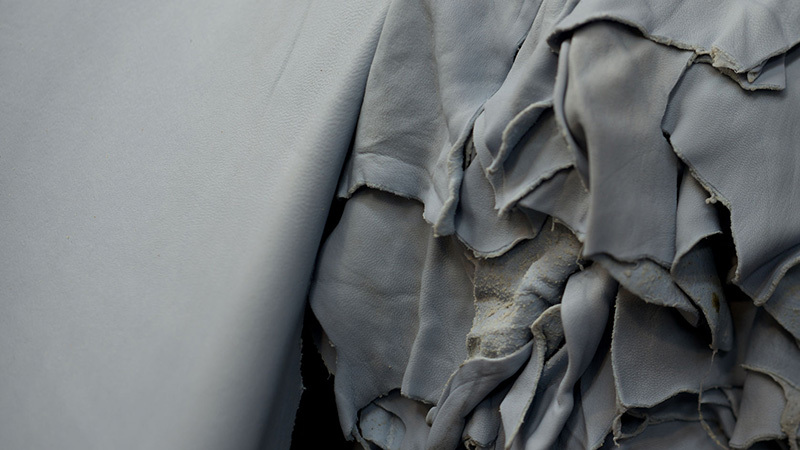 What’s the difference between suede and roughout? Why is shell cordovan so expensive? In this last section we’ll go over some common boot leathers and explain what makes each one unique. Calfskin is leather made from the skins of young cattle. It is primarily used in higher end boots and dress shoes. Calfskin is known for it’s soft and supple properties. High quality calfskin boots require regular upkeep to prevent the leather from drying and cracking. What’s great about calfskin however, is that with the proper care it can remain soft and supple for the lifetime of the boot. Although chamois leather originally comes from the chamois European mountain goat, the chamois you see today is almost exclusively from oil-tanned sheepskin or lambskin. Genuine chamois has it’s grain removed and only the remaining flesh side split is used. This gives chamois a number of unique properties such as being non-abrasive, soft to the touch, and highly water absorbent. In boots and shoes, chamois makes for an attractive soft-hand leather with a short nap. Kudu is a game leather whose hide comes from the Kudu antelope of Africa. It’s high price accounts for it’s rarity and unique properties. For one, it’s a strong leather that is durable enough to use in footwear. But it’s also incredibly soft and supple. Kudu leather is known for it’s scarring and pitting which makes for unique hides and it’s not uncommon for bootmakers to feature these imperfections in their product. You’ll often see higher end boots made of either full grain Kudu or suede. Real kudu leather should not be confused with Horween Kudu leather of the same name. Horween Kudu is a thick oil treated calfskin leather used in many Alden boots. 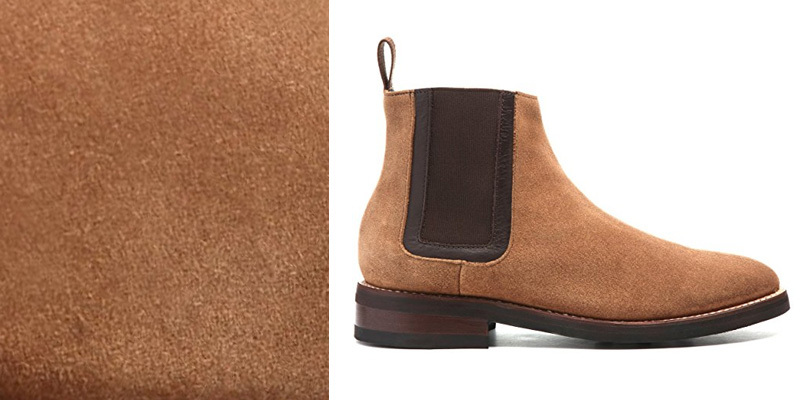 Nubuck is a top grain leather that is known for it’s velvety-like surface. This surface is achieved by sanding down the grain to create a short nap that feels smooth to the touch. Unlike suede which is made from the leather split, nubuck retains the strength and durability commonly found in top-grain leathers where the fibers are more robust. 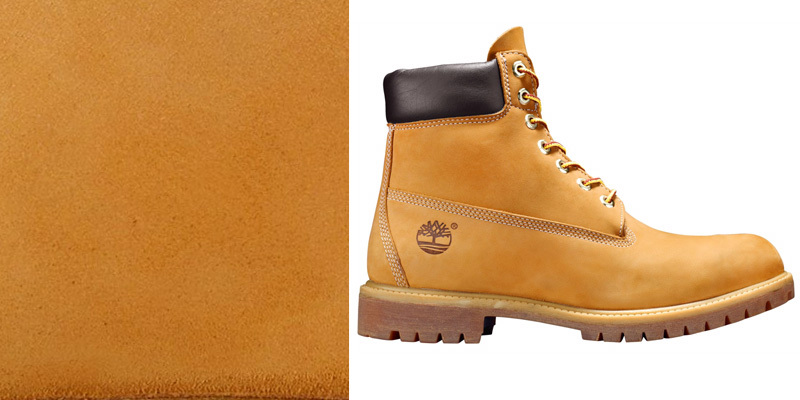 One of the most recognizable boots made with nubuck is the Timberland 6-inch boot. Patent leather was first introduced in the early 19th century and has since been used as a formal leather reserved for dress boots and shoes. Traditionally the process to “patent” a leather requires a long process using an oil lacquer coating to achieve a high-gloss finish. Unfortunately, a lot of the craftsmanship behind patent leather has been replaced with a plastic coating that is common with cheaper patent leather boots. Pebble grain, also known as Scotch Grain, is easily identified by it’s “pebbled” texture. Originally, scotch grain was made with leather that had been tanned to give it a shriveled appearance. True scotch grain is increasingly rare as most modern tanneries now press and stamp the pebbled pattern onto the leather grain. Like most types of leather, pebble grain varies in quality and grade. Pebble grain leather can be made from high quality full-grain leather, such as Horween CXL Pebble Grain, or simply be stamped low-end corrected leather. Ok, so PU leather isn't leather but it’s still worth a mention as chances are you have come across the term. There are two kinds of PU leather. The first is a bonded leather - leather bonded with polyurethane. The second is pure polyurethane that is completely man made. PU attempts to mimic the look of real genuine leather. Man made PU leather is most commonly used in vegan boots while the bonded kind of PU is usually only found in very cheap footwear. Pull-up is a leather whose color temporarily lightens when you pinch or put pressure on the leather. Pull-up leathers aren’t necessarily a type of leather, but rather a heavily oiled and waxed leather that displays these characteristics. The lightening effect is caused by the oils moving around in the leather when pressure is applied. One great thing about pull-up leather is that it ages well due to the oil’s ability to absorb scuffs and scrapes. 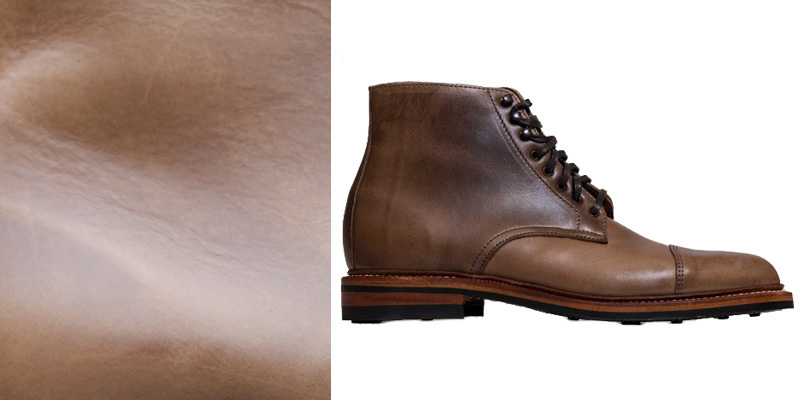 In leather boots, the most popular example of pull-up leather is Horween Chromexcel (CXL) leather. Roughout is a top-grain leather that is made from the flesh side of the hide where the texture is nappy. Since the grain stays in-tact underneath, rough out leather keeps it’s toughness and durability. Roughout boots tend to age gracefully since the leather doesn’t need much upkeep over it’s lifespan. This is why rough out leather has historically been used in mountaineering, military and work boots. Shell cordovan is arguably the best leather you can buy thanks to it’s unique properties and rarity. Shell cordovan is made from a horse’s “shell” or behind. The leather from this area is extremely hardwearing and highly water-resistant which makes it perfect for use in footwear. It’s also a rare leather that is very expensive to purchase. One example of what makes shell cordovan so special is how it “folds” instead of “creases”. Instead of the usual creasing found in cow hide and calfskin, shell cordovan folds around stress points. This creates an attractive wave effect that adds character to footwear over time. Suede is a popular split leather that is sanded or buffed to give it it’s fuzzy nap. It’s known for it’s soft hand and flexibility which makes it incredibly easy to work with. But unfortunately suede lacks durability and isn’t very hardwearing. It’s lack of water resistance also means it’s harder to maintain and more prone to staining. Suede is usually considered informal and reserved for casual boots and shoes. Although most suede is made from the split, there are kinds of full-grain suede that are a bit more resilient to wear.